Timberwise Canterbury were recently contacted by the owners of a timber framed converted barn in Ashford, Kent to survey the timbers within the property as there were concerns that there was wood rot present as a result of an infestation by wood boring insects. 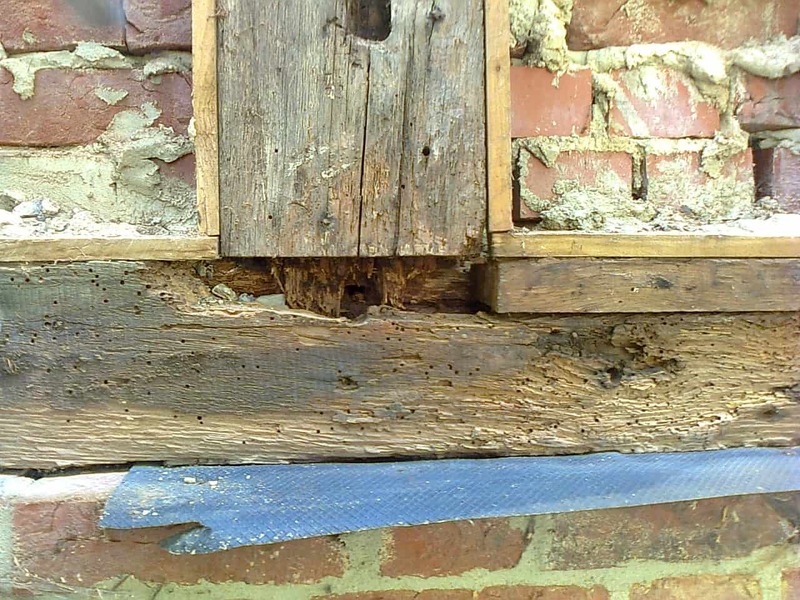 Upon inspecting the timbers it became clear who the culprit was for the damage – Death Watch Beetle. The picture below shows the damage caused by the infestation. Deathwatch beetles create small neat exit holes that are around 3mm in diameter, these are clearly visible on the photo. Often traces of bore dust (frass) may be observed in or around the hole. Do you suspect a Death Watch Beetle infestation? If you believe you have an infestation of deathwatch beetle it is recommended that a specialist surveyor should be engaged to carry out a survey. The surveyor will be able to determine the type of beetle causing the infestation and whether the infestation is current or historic. To arrange a timber survey from Timberwise call 0800 288 8660 to speak to your local office or complete our on-line survey request form.